Get Do a Day in Print, Kindle, iBooks, Audiobook and other formats today! Stop vetting him and start booking him while you still have a chance. Bryan did the work to research the show so he could come with tailored content and great energy and presence. Stop vetting him and start scheduling him while you still have a chance. Bryan stayed true to himself and was spot on with content. Bryan brought great energy. He stayed true to himself and was spot on with content. Bryan encouraged me to take intelligent risks in my career and then supported me when I did. Bryan helped me figure out my purpose and motivation for losing weight, and life in general. Bryan laid the groundwork for future growth by not only asking critical questions of me, but by showing me how to effectively ask them of my team. By using Do a Day, I feel better about myself and life. 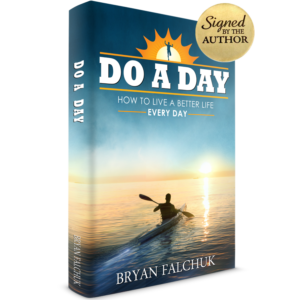 The Do a Day philosophy epitomizes the craving that lives within each of us. Bryan takes challenges as opportunities and taught me how to do the same. Stay Updated on Do a Day News! All content, images and concepts © Bryan Falchuk. No part of this site or the content found through it may be used or reproduced in any manner whatsoever without express written permission. 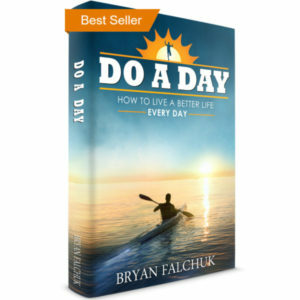 Do a Day® and the Do a Day logo are registered trademarks of Bryan Falchuk. The information and ideas presented in this site are not intended as medical advice or as a substitute for medical counseling. You expressly assume such risks and waive, relinquish and release any claim, which you may have against the author for any of the content found on or through this site.